Above and below: Fourth Annual Flotilla to shut down Enbridge Line 5 in Michigan at Straits of Mackinac. From Native News Online photographs by Levi Rickert. Enbridge Protest in Michign. From Native News Online photographs by Levi Rickert. 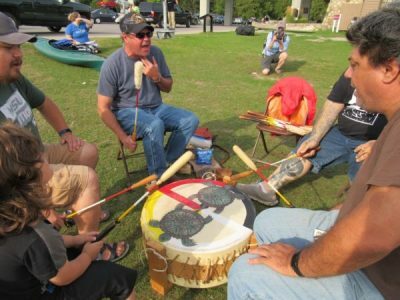 Several groups of American Indians and environmental advocates spent their Saturday of this Labor Day weekend protesting Enbridge Line 5, an outdated oil pipeline that needs to be retired according to Sault Tribe of Chippewa Indians Chairperson Aaron Payment, who also is the vice president of the National Congress of American Indians. Helen “Granny” Red Feather from Wounded Knee on Pine Ridge Indian Reservation in South Dakota. From Native News Online. Speaking at a press conference following the large protest flotilla, Michigan tribal leaders, political candidates and elected officials, called on Michigan Governor Rick Snyder and other elected officials to decommission Line 5, with one lawmaker noting this is the fourth year protesters have taken to the water in support of shutting down the 65-year-old pipeline. Niizh Mishiikenh drum group. From Native News Online. 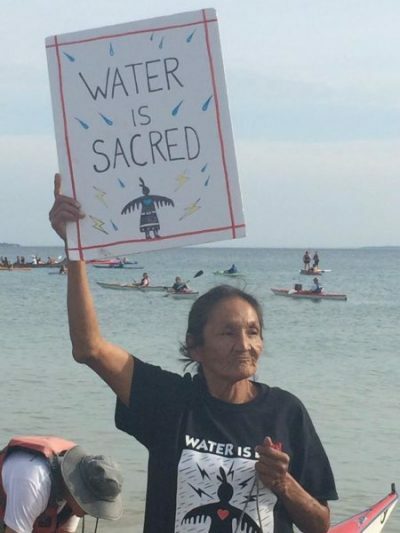 Several American Indians traveled from various states and Canada to take part in Saturday’s protest, including Helen “Granny” Red Feather, who was at Wounded Knee in 1973 and last year’s resistance to the Dakota Access pipeline at Standing Rock. Red Feather drove from her home at Wounded Knee on the Pine Ridge Indian Reservation. 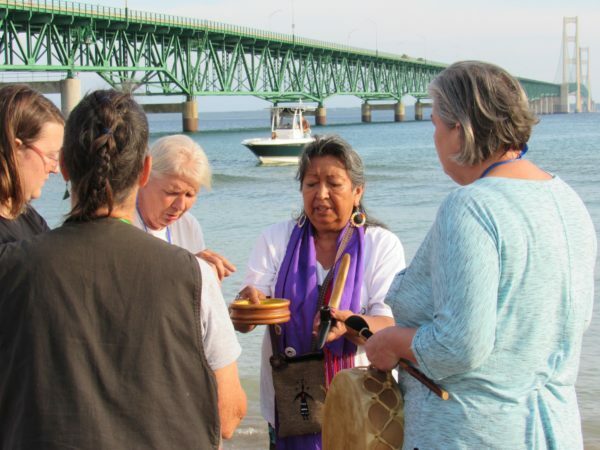 Beatrice Menase Kwe Jackson performed a water ceremony. Water is life. A fundamental principle many politicians fail to grasp.